Coral gardening, or asexual coral propagation, methods use fragments of corals from donor colonies or wild populations that are generated by disturbances (‘corals of opportunity’ and may include fragments broken from storms, anchoring, or vessel grounding). Fragments are transported to a nursery where they are grown for several months (approximately 6-12 months depending on the species), and then propagated to create new material for nursery expansion or outplanting. Propagating nursery colonies during initial years is necessary to increase the stock of the nursery, further increasing nursery capacity. Finally, coral colonies are transported and outplanted back onto natural reefs to grow and become reproductive, spawning members of the population. Raising coral colonies in nurseries allows practitioners to generate hundreds of colonies while minimizing the damage and risk to existing coral populations. Many nursery programs have successfully grown their nursery stocks to thousands of corals within a few years from an initial stock of just 100 colonies from the wild population. Whereas past coral restoration projects often moved corals from a healthy to a damaged site to help speed up the recovery, ref nurseries have allowed restoration practitioners to grow corals after taking only 10% of a wild donor colony. Since the early 2000s, numerous techniques have been developed to increase the growth and survivorship of corals in nurseries. ref Propagation can occur in field-based (in-situ) or land-based (ex-situ) nurseries. There are advantages and disadvantages to each nursery type that ultimately depend on the resources available and goals of the restoration program. Field-based nurseries, for example, are often lower cost and use low-tech materials and equipment, but are subject to environmental extremes like warm temperatures and storms. Land-based nurseries, by contrast, can be regularly monitored and maintained, but are generally more expensive and require more experienced staff. While field-based nurseries remain the most commonly used nursery type, both nurseries can quickly generate high numbers of coral colonies. In this section, we discuss important considerations for creating a field-based or land-based nursery, various nursery structures used by practitioners, methods for construction and implementation, collecting, propagating, and outplanting coral colonies onto reefs. 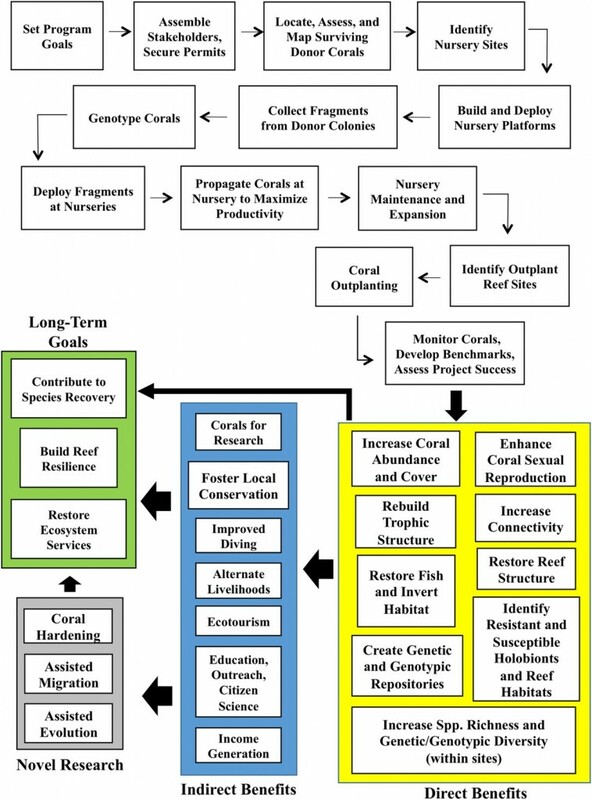 During this planning phase, we suggest following the conceptual diagram developed by Lirman and Schopmeyer (2016) as a coral gardening framework. Conceptual diagram of the steps and planning for coral colony propagation, developed by Lirman and Schopmeyer (2016).